· What concrete strategies are being tried in different contexts worldwide, to promote and support women leaders in economic, political and social institutions - including states, financial institutions, community institutions, and the household? · Do women leaders make a difference in terms of gender equality outcomes, and pro-poor outcomes? How can women leaders with progressive agendas be supported? What attracts women to conservative or fundamentalist political groupings? · What else needs to change to ensure the specific interests of women living in poverty are reflected and met? · What should the role of development organisations be in supporting women's leadership? What are the challenges? Gender & Development provides an opportunity for all involved in development (researchers, practitioners, policy-makers, activists, etc) who uphold gender equality and women's rights to reflect on their work and share learning. The journal is published three times each year and each issue focuses on a particular in gender and development. If you are interested in writing for this issue exploring any of the above or related themes, please send a paragraph outlining your proposed idea to gadeditor@oxfam.org.uk by February 7, 2008. Visit www.genderanddevelopment.org for more information. Nominations are being accepted for this year's Tech Museum Awards. From the site: "The Tech Museum Awards is a programme that aims to honour and award innovators from around the world who use technology to benefit humanity. Five Laureates in each category are honoured, and one Laureate per category receives US$50,000. Indiviudals and organisations who apply should show how their technology application significantly improves the human condition in one of the five award areas: economic development, education, environment, equality, or health. Deadline for application is March 24, 2008. Check the site for more info: http://techawards.thetech.org/. Slave Chamber, originally uploaded by oreoluwa. This was the final stop on our Spice Tour. We were taken to a beach in Mangapwani to work off our lunch. As the bus makes its way back to Stone Town, we were driven to this former slave cave and given the option to get out and see it quickly. Most in our party declined (it had been a long day, so I couldn't blame them), but I was curious so along with a handful of others, we paid our 1,000 Tsh (roughly equivalent to 1 USD) and descended into the dungeon. Slaves were hidden in here after trade in slaves was abolished. 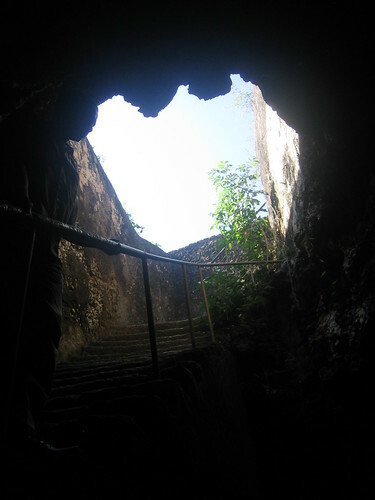 The cave is a dank pit, which appeared to spiral into the ground. After taking about 20 steps down, the daylight was already being subsumed by the underground darkness. I climbed down as far as my slippers would allow me to on the slippery and damp ground. Our lone torch gave out and my camera battery, which I had been carefully nursing all through the trip (not having a battery charger with me) eventually failed. It was time to call it a day and head back. 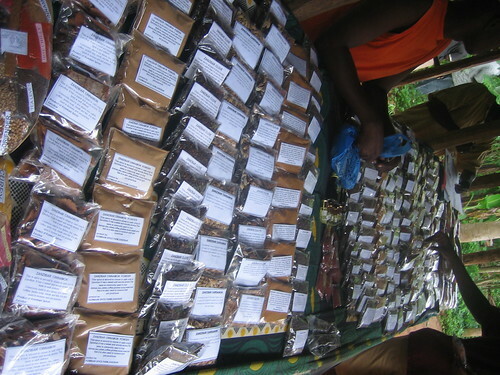 Spices for Sale, originally uploaded by oreoluwa. After the harvesting and processing, here lies the final product. The Nutmeg, originally uploaded by oreoluwa. 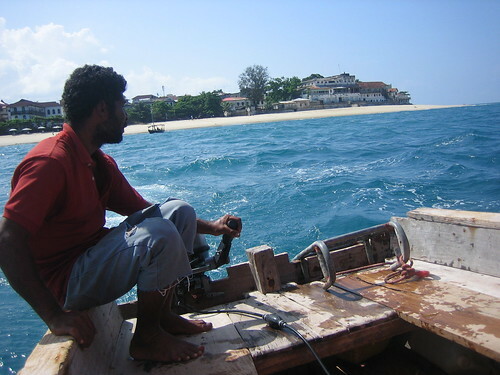 Everyone who visits Zanzibar MUST go on the Spice Tour. It's like you didn't even visit Zanazibar if you didn't go on the Spice Tour. So, we went on the Spice Tour. I also happen to like spices and the mental pictures of tasty food that the word 'spice' conjures up for me. Plus, at the end of the tour, participants are treated to a meal featuring many of the island's famous spices. This photograph is of the nutmeg, which is one of my favourite spices. 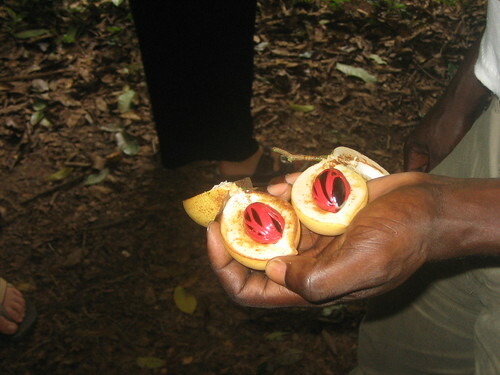 I had never seen it in its raw form, so it was with utter fascination I watched as the tour guide pointed to a yellow, soft looking fruit and declared it to be "nutmeg". We all looked at him rather disbelievingly until he pulled one off the tree and split it open to reveal the familiar-looking brown nut. 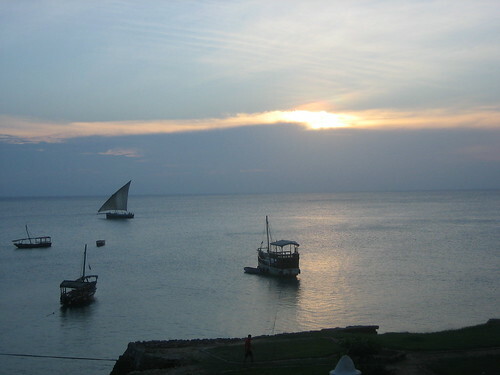 Zanzibar Sunset, originally uploaded by oreoluwa. So we went to the first floor of the Africa House Hotel to see the famed view of the sunset, along with what seemed like just about every other tourist on the island (oh, I hate to be such a 'touristy' tourist and be seen doing what everyone else is doing). We ordered a couple of their rather over-priced drinks and settled down to watch the sun set. It all happened so fast and then I guess I got slightly distracted with my people watching and so this is the photograph I ended up with. It seems to be the norm for tourists now to wield heavy-duty, professional-looking cameras. What happened to the simple point-and-shoots of yore? As I sat there, I could actually see some people nervously bringing out their point-and-shoots, apparently intimidated by the preponderance of the DC4S/PP (Digital Cameras for Serious/Professional Photographers). LOL!! We were at the Africa House Hotel for maybe about 30 minutes. The sun doesn't take that long to set, and before we knew it the mosquitoes were out in full effect, chomping at our ankles and anywhere else they could reach (which, it seemed was EVERYWHERE, including fully-clothed parts). Not wanting to be reduced to insect meal, Funke and I hastily paid and beat a hurried retreat (along with all the other tourists) to the door. View from the Archipelago Restaurant, originally uploaded by oreoluwa. You can see (or perhaps not, for all the foliage) the Monsoon Restaurant. According to my guide book, if one restaurant on this island is hard to get a table at, it is this one. Or could be, on Thursday nights when they have live music. We ate there one night (obviously we got a table). The food was not bad, though again it didn't live up the expectation that the guide book had built-up. Or then again, perhaps I'm a philistine when it comes to fine dining. BTW, I think the best meals I had were at ETC Plaza and Les Spices Rendez-Vous (the New Maharaja Restaurant). It took us FOREVER to find ETC PLaza, but the food was so worth it when we got there. The night we went to Les Spices, we were actually looking for another restaurant, which must have closed down and which must also have been so bad that no one missed it either, as no one seemed to know it. This picture was taken from Archipelago Restaurant, another place with excellent food. Another ocean view from Prison Island, originally uploaded by oreoluwa. Yes, yes, I know. Yet ANOTHER shot of the ocean. Can you blame me? It's so beautiful. Speedy Gonzales, originally uploaded by oreoluwa. I LOVE this picture; it's easily my favourite of all the pictures I took (What? This blurry thing?). Mr. T looks likes he's dashing off for a very important appointment. 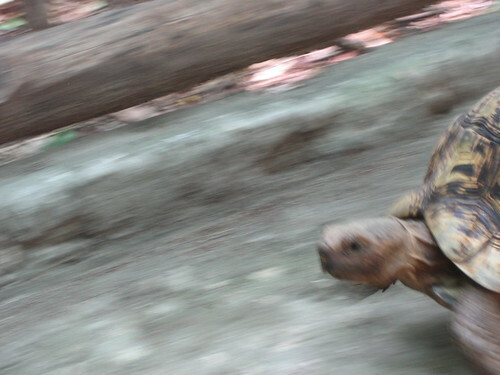 Infact, someone who saw this picture asked me where the tortoise was running to. Then she caught herself and laughed. This 'masterpiece' was no doubt the result of a shaky hand, or perhaps I sneezed as I snapped. This was taken on the tortoise farm on Prison Island. It's funny; Funke and I were chattering away as we walked into the tortoise farm. The guide asked us if we were from Nigeria. We were very surprised at his dead-on accuracy, especially since of all the tourists we had met on the island, we were the only Nigerians and, from what I gathered, there are not many Nigerians visiting Zanzibar in general. - "How did you know we were Nigerians?" we asked the guide. - "Oh", he responded off-handedly, "Nigerians are always SO loud." 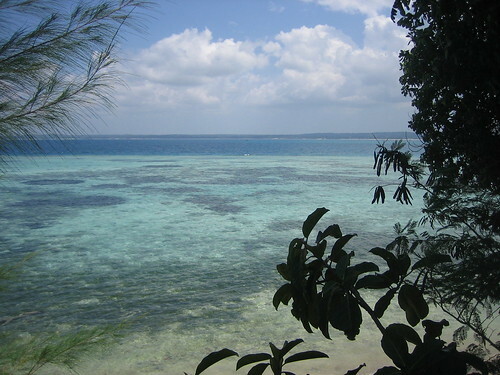 Prison Island Beach, originally uploaded by oreoluwa. I ended up with a lot of beach shots. Well, I couldn't help it. There was a Kodak moment everywhere I looked. The beaches were so clean and beautiful that although I feared that the pictures would all look the same, at the time I wanted to capture as much of the natural beauty as I could. Cameras of course don't do justice, but you get the idea. Approaching Prison Island, originally uploaded by oreoluwa. Sailor, originally uploaded by oreoluwa. I was a bit worried about being sea-sick on this trip, especially since I had just wolfed down a sizeable breakfast minutes before we clambered on the small boat. However, I discovered that I must have some solid sea legs (well, perhaps, the gently lapping waves were not the most rigorous test for how prone to sea-sickness I am). Our sailor (or 'driver' as the owner of the fleet of boats referred to him) was a man of few words (I'm sure it didn't help that we didn't speak a lick of Swahili other than "Jambo" and "Mambo" and his English was pretty limited). That suited me fine, talkative drivers, when you're not in the mood, don't make for a very relaxing journey. Tembo Hotel from the water, originally uploaded by oreoluwa. 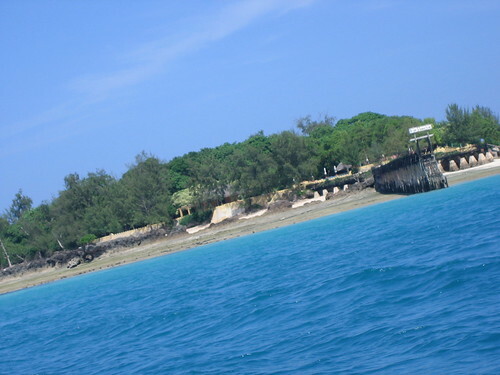 On our second day, we took a boat trip to Prison Island, also known as Changuu Island. A huge prison was built on the island, but never used for that purpose. Instead, it was used by the British as a yellow fever quarantine camp. Now, it is a tourist spot, attracting people to its serenity (there are chalets for people who wish to stay on the island). This is the view of our hotel from the boat. 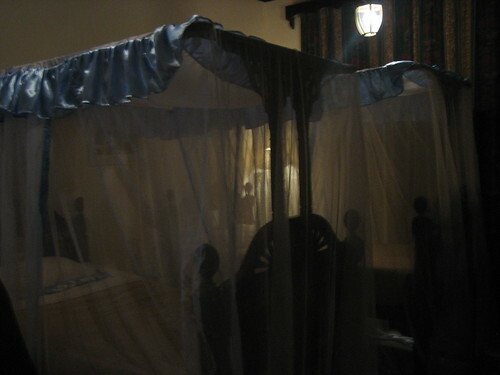 Mosquito Nets, originally uploaded by oreoluwa. Now, this took me back to my childhood. Mosquitoes are plentiful on the island, so the hotel staff sprayed the rooms every evening. By the time you returned to your room, you'd find the windows firmly shut, with the mosquito nets now draped over the beds, and the lingering scent of the insecticide in the air. On our first evening, when Funke and I saw the made beds, we shrieked with glee and nostalgia. View of the Tembo Hotel, originally uploaded by oreoluwa. I think I was sitting by the poolside or the patio of our hotel when I took this picture. I loved our hotel. 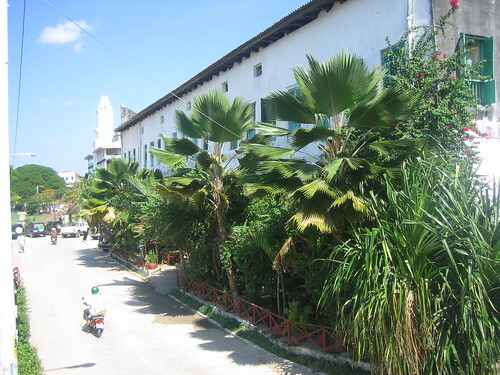 The Rough Guide mentioned something about rude staff, but the hotel manager was very friendly and talked to Funke and I at great lengths about Zanzibar's history. He also recommended quite a few places for us to see and things to do. The rest of the staff was also very approachable. The food wasn't bad, though the dinner, as we later found out, was relatively expensive. 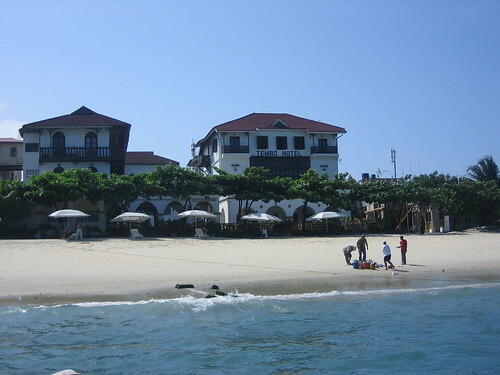 The Tembo Hotel sits by the water and apparently used to be the US Consulate building. I am guessing that being by the water constituted something of a security risk. The hotel decor reflected the strong Arab influences on the island, from the ottomans, to the rugs and the tiles. I would definitely recommend this hotel. 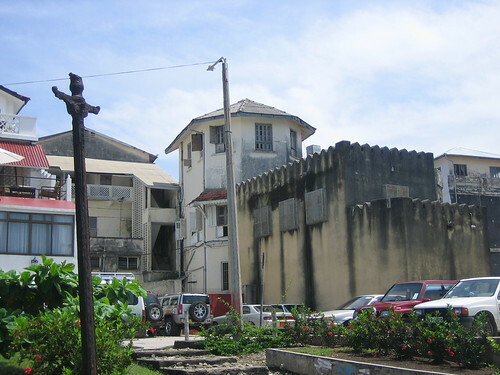 View of Stone Town by the Africa House Hotel, originally uploaded by oreoluwa. I realised that I didn't take many/any photographs of the narrow, winding streets that the mention of Zanzibar conjures. Shame on me, but it's always like that, I find. I get home and look at my selection of photos and wonder where my head was at the time. Anyway, this photo, taken in front of the Africa House Hotel, but of the buildings next to it (I think this was actually a test shot or something) is probably the closest thing I have that shows the tall, narrow, white-washed buildings that are so common in Stone Town. You will notice the cars parked in front of the buildings. I was surprised at the large number of cars, for such a tiny island with such (in some places) incredibly narrow streets. Forodhani Gardens, originally uploaded by oreoluwa. 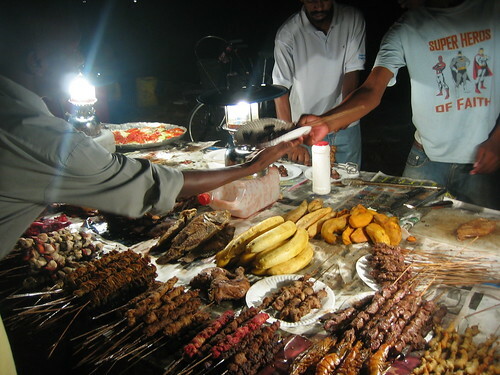 People (both tourist and local Zanzibaris alike) gather at Forodhani Gardens at night to feast on a dizzying array of meat and seafood. You pick what you want and the vendor roasts its for you. Eating at FG is a strictly no-frills affair, with food served in disposable paper plates. You sit at any one of the wooden tables and benches, with cats scurrying around your feet waiting for scraps. I used to hate cats. I've gotten over that now - albeit firmly in the 'dog person' camp - but it was still slightly disconcerting for me to have so many cats in such close proximity. The food was good though a bit of a let-down. I suppose that can happen when your expectations have been built sky-high by many excellent reviews of the food. For an island so famous for its spices, I thought more should have been used in the food. Forodhani is great for people watching, especially seeing young Zanzibari men practice English with young female tourists. 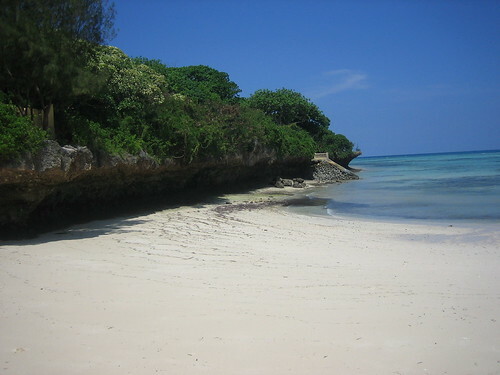 Beach by Africa House Hotel, originally uploaded by oreoluwa. On our first day we strolled near the hotel and passed the Serena Inn (very expensive hotel - about 300 USD for their cheapest room, but gorgeous lobby) and ended up in fornt of the Africa House Hotel. 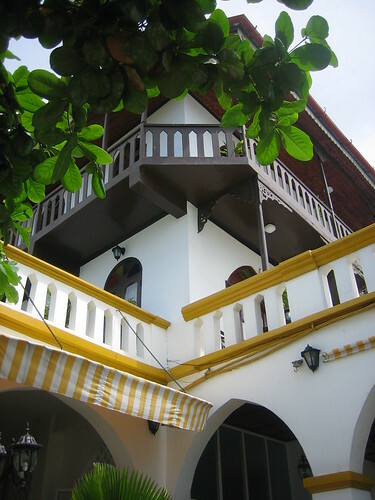 The Africa House Hotel, formerly the English Club and now famous for its prime view of the sun setting into the Indian Ocean. 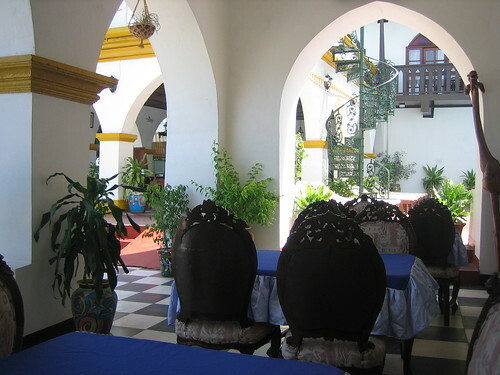 Tembo Hotel dining patio, originally uploaded by oreoluwa. This was the sunny patio, where my friend Funke and I had breakfast every morning (we only ate dinner at the hotel once, preferring to try other places). It's such a wonderful thing to be able to eat in such a beautiful space, looking out at a gorgeous view. I totally loved loved this hotel and was glad that we chose to stay at a beach-front hotel, as opposed to one more in the centre of town. Oh, it's been a long while since my last post, I know. Obviously I have been resting after what was a very, very busy year for me. This was one of the best Christmases (and birthdays) I have had in a long time. I'm too tired to write about it all properly now so that will have to wait until later. One thing I have to mention is that you never know who reads your blog. You have a fair idea about some of the people who stop by (they comment, or they lurk but you know they lurk). So many others lurk and you never know until they tell you. So that is how I found out that many of my co-workers read my blog regularly and I never knew. Not only are some of them regular readers, but some of them have been reading it for at least a year. Interesting. It made me frantically think back to all my posts for anything with potential incriminating information. Luckily, I don't think there is any, or if there is, I have happily forgotten about it (let it stay that way too). 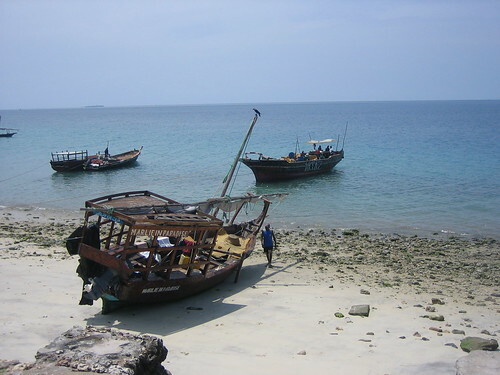 I have a lot to catch-up on and pics of Zanzibar to post and will try and do that by and by.